The gently sloped hills also formed, have a chalky composition that are arid with a sparse top soil, perfect for white wines. Colli Euganei shares the same latitude as Bordeaux and coupled with a mild Mediterranean climate, these hills are ideal for vineyards. Vignalta, which means “high vines,” is located at a high elevation. Gomiero currently has 55 hectares (123 acres) in different plots on south facing slopes of the Colli Euganei. Producing 20,000 cases of wine annually, Vignalta is recognized each year for their quality wines. They have received 14 Tre Bicchieri awards, Italy’s highest wine award, from Gambero Rosso. Vignatla Gemola has received the Tre Bicchieri honor for 10 vintages, while Alpinae has received it twice and the single vineyard Arqua and the Cabernet Riserva have each received Tre Bichhieri once. Vignalta is also one of the first wineries in Italy to use solar power for the production of electricity in their modern winery. So how does the king of radicchio fit into this? In 1987, a friend of Gomiero’s was a radicchio farmer. In fact, he was the largest radicchio grower in Italy. He had heard that there was a demand for radicchio in the United States, so Gomiero came with a bag of seeds and planted radicchio in Salinas. Within a few years, he was reportedly the largest radicchio grower in the world, selling to Canada and Japan as well. And, for eight years, Gomiero commuted between Colli Euganei and Salinas. Today, Gomiero commutes between Colli Euganei and San Diego, where he has a home with his family. He continues to make award-winning wines at Vignalta and also has a winery in Tuscany called La Fiorita, which produces highly rated Brunello. 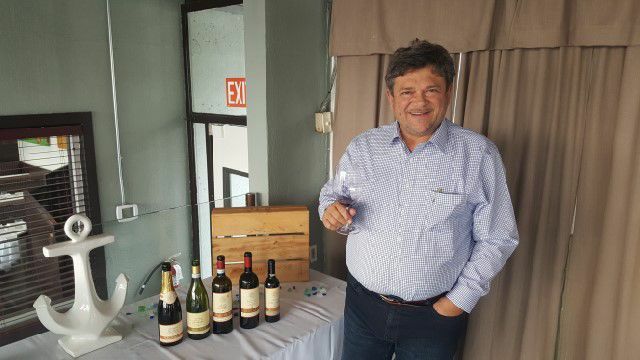 At a recent lunch in Los Angeles, I enjoyed a tasting of some of the wines of Vignalta, followed by more tasting at the recent Gambero Rosso Tre Bichhieri event. Vignalta Brut Nature: Made with the indigenous red grape friularo (aka raboso piave), this wine is made in the traditional method champenoise. Vignalta is the one winery to make a sparkling wine with this big cluster grape, which is late ripening, low in sugar and high in acid. It spends two years on the lees before disgorging and there is no dosage. The golden color wine is rich on the palate and makes for a wonderful aperitif. Colli Euganei Fior d’Arancio 2015: Made from the aromatic orange muscat, this sparkling wine has notes of apricot, tangerine and orange blossom. It is light and refreshing. It is sweet but the acidity keeps in in balance. This wine is considered perfect for weddings as the “fiori d’Arancio” is the name for a wedding bouquet. Colli Euganei 2015 Pinot Bianco: While the Veneto region is known for the pink skinned pinot grigio, the grape is not grown in Colli Euganei. Instead they grow pinot bianco. Both grapes are mutations of pinot noir, sharing the same DNA but having different color skins. The volcanic soil of the high-elevation vineyard produces a wine with intense minerality and citrus notes and an elegant salinity on the finish. Colli Euganei 2010 Rosso Riserva (60 percent merlot, 40 percent cabernet sauvignon): Following the devastation from phylloxera in the 1800s, and due to the shared latitude with Bordeaux, merlot and cabernet sauvignon have been grown in this area for 200 years. They are practically indigenous today. The Rosso Riserva is balanced between aromas for fruit, tobacco and herbs and tannins. Colli Euganei 2011 Gemola: (70 percent merlot, 30 percent cabernet franc): Gemola is a single-vineyard wine from this “little gem” of a vineyard on Gemola hill. The superior-quality fruit, grown on decomposed lava rock, is the flagship of Vignalta, having received the Tre Bicchieri honor 10 times. It is an elegant wine with black fruit notes, such as boysenberry, and sweet notes, such as cedar. Colli Euganei Fior d’Arancio Passito Alpianae 2012: Inspired by Recioto di Soave made in the Veneto, the Alpianae is the first passito made with orange moscato. The grapes are dried on trays for four months where they shrivel and concentrate flavors. The resulting wine has intense notes of apricot, candied orange peel, coriander and cardamom.